Colton Leonard has built a massive frame through hard work and detailed eating. To feed his machine, he eats … a lot. Check out his nutrition plan to see how strongmen consume! Colton Leonard may get full, but he can always eat more. For most people, shoveling in thousands of extra calories a day would mean a life of comatose couch-dwelling, struggling to move that chips bag out of their line-of-sight. 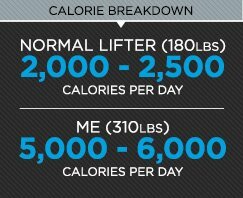 But for a 300-pound strongman, 6,000 calories is just a normal day. That's right, 6k. You're like, whaaaat? And we're like, yup! This is only possible because the giants of powerlifting and strongman work like crazy in the gym. They perform traditional lifts, but they also work on endurance and event-specific training that can overwhelm and break down an unprepared body. Size gives Leonard extra ballast, leverage, so he can lift more and perform better. He must eat to maintain his mass and restore his energy to keep moving. Nutrition is key, so Leonard looks at eating in percentages. He often follows an 85/15 or a 95/5 rule depending upon his current goals (the higher percentage is "clean," the lower "dirty"). "Regardless of your sport, you have to eat for your training style," Leonard says. "Your diet may need to change on a daily basis depending on your needs and goals. If you eat the same amount of calories on a leg day as you eat on an off day, you may not be optimizing your diet. I use peanut-butter-and-banana sandwiches when life gets crazy and I need to fill gaps in my nutritional needs. I heard it put best like this: When you stop looking at food for pleasure and look at it like medication, you'll get it. Keep it clean, count your calories, and put in the effort." Strongmen burn immense amounts of calories both when they train and when they compete. If Leonard consumed 2,000 calories per day, a normal amount for most individuals, his strength and size would quickly dwindle. His body would no longer be able to keep up. "Adjust it to your personal level," he said. "Just because I weigh 310 pounds and can eat 5-6,000 calories per day, that doesn't mean you need to. You need less than that." He is a big promoter of peanut butter and jelly sandwiches, which he says have tons of fiber and nutrients. While that certainly depends on the sandwich, there's no doubt that PB&J is a quick and easy way to get extra calories throughout the day. He tosses the miraculous sandwich in between chicken and rice meals to increase his calories without ruining his diet. "I prefer to eat bigger meals," Leonard says. "I enjoy eating—I just do. So when I sit down, I want to eat a big meal and feel full. Instead of eating 5-8 times per day, I'll eat four times per day in bigger quantities at those sittings. That still spaces me out at about three hours. I don't go much longer than that without eating." He keeps his protein sources clean and drinks several protein shakes each day, but he also gorges on plenty of chicken and red meat a couple of times each week. His carbohydrate sources are mainly sweet potatoes and wheat breads, wheat tortillas, and vegetable salads. "I may sit down and eat a pizza with my wife and enjoy it, but I know I don't need to go out the next day and eat another pizza," Leonard said. "I can eat a cheeseburger or pizza and get tons of calories from that, but when I go train I feel horrible after I eat a big greasy meal like that. I'm not saying I leave those things out of my diet, but there are proper times to incorporate them." So does Leonard love burger and tacos? Of course. But he can pull them off because they're tools in addition to being treats. He eats them when it works with his training, and he keeps conservative about it. "I think that's a good way of looking at it for people," Leonard says. "Maybe they are training for strength, but of course they want to stay healthy. It's just moderation. You balance your lifestyle and your eating habits." The lesson here is if you eat pizza, burgers and fries every day, you are not going to perform well, no matter what else you do. When you eat clean and healthy foods, you perform better, feel better, and can maintain some dietary flexibility when the urge strikes you. "I noticed a huge difference in my training, when I eat clean and when I don't," Leonard says. Building up for a contest: "Whatever my wife cooks—in proper portions, of course. The extra calories and carbs help. I am a strongman after all!" 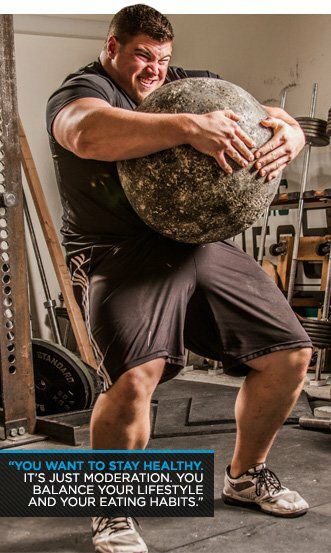 If you want to learn more about Colton Leonard, or more about strongman, please feel free to contact him. You can find him here on Bodybuilding.com on BodySpace or you can hit him up on Facebook or Twitter. If you want more great articles or videos and content like this, make sure to keep coming back to Bodybuilding.com.